Bleach blonde spikes, rockin’ goatee, and collection of loud shirts aside, there’s more to the Food Network bad boy than meets the eye. He may be so iconic that you can even get a Halloween costume and pretend to be him, but that’s because Guy Fieri is outrageous. His food is also outrageously good and there’s more coming. Whether or not you’ve had the chance to try his latest venture yet, have no fear, it’s probably coming to a town near you. Fieri has teamed up with Robert Earl, the founder of Planet Hollywood. 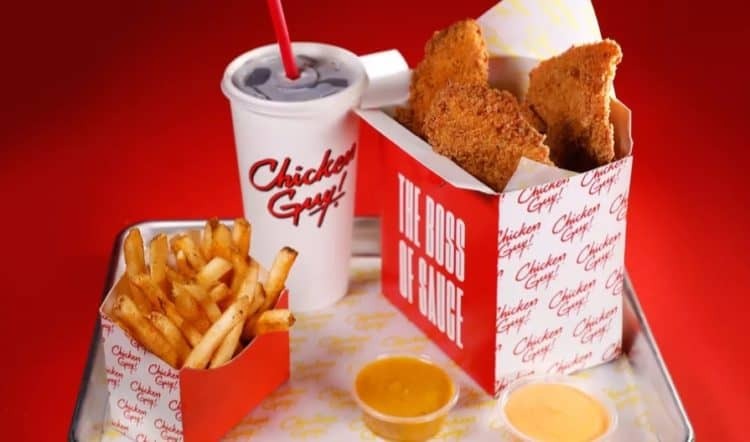 Together the two dreamed up and launched a fast-casual chicken restaurant known as Chicken Guy! and the food looks amazing. We all know Guy Fieri is no stranger to food. If you’ve been watching Guy’s Grocery Games, or Guy’s Big Bite, or even Diners, Drive-ins and Dives, then you know this “guy” can eat. He does more than just drive around in bowling shirts and taste food though. He opened his first restaurant in the mid-90s. Working with partner Steve Gruber the pair opened Johnny Garlic’s, which they described as a “California Pasta Grill”. They co-owned several locations and even branched out to open a fun joint called Tex-Wasabis that served primarily barbecue and sushi. By 2011 he had partnered up with Carnival Cruise Lines to create Guy’s Burger Joint. His food was offered to sun-soaked vacationers fleet wide. His success clearly has never been confined to the numerous Food Network shows that built much of his fame. In 2012 Guy’s American Kitchen and Bar, opened in New York, and though there was a famous scandal involving a very unsatisfied restaurant reviewer, the food clearly wasn’t bad. The original Kitchen Bar made Restaurant Business’s list of the top 100 independent restaurants four years in a row. Sometimes the old adage that says “any press is good press, as long as it’s not an obituary” turns out to be all too true. That review may be the most read food review of all time, but it didn’t stop Fieri. A second location called Guy Fieri’s Vegas Kitchen and Bar opened two years later in 2014. Chicken Guy! is the latest in a long line of Guy-inspired food that people have been enjoying since the mid-90s, though it must be noted that opening a shop in Disney Springs at Walt Disney World is a unique accomplishment. Expansion plans for the brand include a Mall location in Miami coming soon. Beyond that, the pair have big dreams and intend to branch out across America. The bleach blonde spikes, rockin’ goatee, and collection of loud shirts aside, there’s more to the Food Network bad boy than meets the eye. He may be loud and a little unorthodox, at least for someone who works with Disney, but he’s always got something cooking for the greater good. He has a history of being one of the first to jump in and lend a hand when there’s a disaster. More than once, with no fanfare at all, Guy has stepped up to feed hungry and displaced people in California. During wildfire incidents, people get displaced from their homes and things can be scary and depressing. Guy Fieri seems to understand that a good hot meal with tasty and filling dishes can do a world of good for his neighbors. In his own way, he is creating the ultimate comfort food, and no one ever talks about it. Not even Guy. Unlike his time in the limelight, there’s no advertising for this. He just does what needs doing because it’s right. Lots of folks see his wild style and boisterous presence and assume that’s all there is to the star. His family probably has something else to say about it, but they don’t spend a whole lot of time on screen. He’s been married to his lovely wife Lori Fieri since before he opened his first restaurant and the couple has two sons. Hunter and Ryder are clearly close to their father’s heart as you can see in the family’s photos. He even named his winery after the boys (Hunt and Ryde Winery). When you look at his history, it makes perfect sense that Guy Fieri would open a national chain of fast-casual chicken restaurants. It almost seems like an inevitable culmination to his career. One thing is certain, with his culinary prowess, the food is certain to be better than the typical fast food fare found at some national chains. We’re looking forward to seeing a Chicken Guy! open up down the street someday.